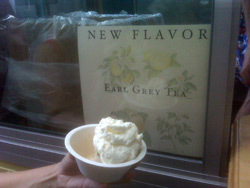 While I have loudly extolled the virtues of Van Leeuwen artisanal ice cream here already, it's absolutely worth revisiting to tell you about their new flavor: Earl Grey Tea! It's wonderful and perfect with their excellent whipped cream. The truck can now be found on weekends outside the Bedford Avenue L stop, which just made my summer a whole lot sweeter.